The Saffron Toucanet (Pteroglossus bailloni) is a species of bird in the Ramphastidae family. It was formerly placed in the monotypic genus Baillonius, but Kimura et al. 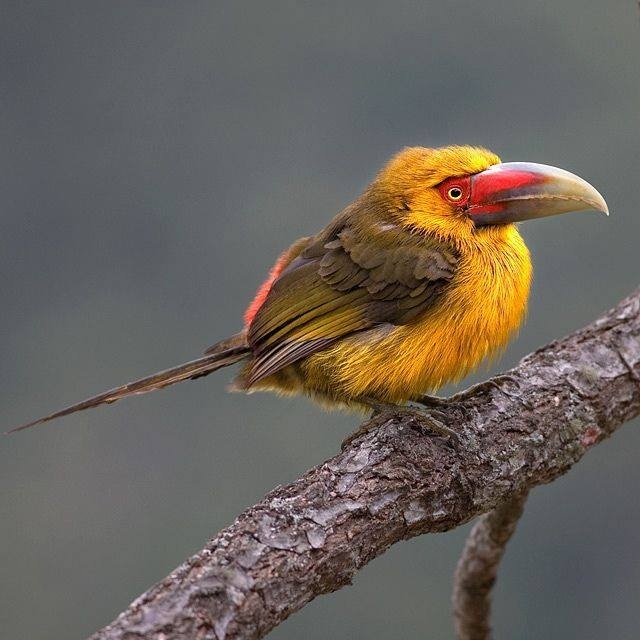 (2004) was able to show that the Saffron Toucanet belongs in the genus Pteroglossus. It is found in Atlantic Forest in far north-eastern Argentina, south-eastern Brazil, and eastern Paraguay. It is a relatively long-tailed toucan with a total length of 35–40 cm (14–16 in). As suggested by its common name, it is, uniquely among toucans, overall saffron yellow. The back and tail are darker, more olive in colour. The rump, ocular skin and patches on the basal half of the otherwise greenish-horn bill are red. The iris is pale yellowish. It is threatened by habitat loss and currently considered Near Threatened by BirdLife International. It occurs in several protected areas, such as the Itatiaia National Park and Parque Estadual Intervales; both in south-eastern Brazil. Despite its bold colouration, in its natural habitat the saffron toucanet is relatively inconspicuous, as it generally creeps around the tree-tops in pairs or small groups searching for fruits such as figs and palm fruits. One observation of this species suggests that it may also eat young birds, as an adult was observed to throw a female woodpecker from its nest, and then clamber inside where it remained for over three hours. The saffron toucanet breeds during June and July in the far north of its range, and December to April in all other regions. Courtship involves the male singing and feeding the female, as well as mutual preening. Once formed, breeding pairs construct a nest by excavating out an old woodpecker hole. The female lays a clutch of two or three eggs, which are incubated by both parent birds for around 16 days. The saffron toucanet has been known to live for over 13 years in captivity.